First right mid-block into parking lot. 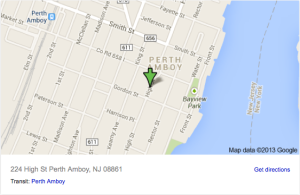 From Penn Station, take the North Jersey Coast Line train to Perth Amboy. Turn left out of the train station and then make your first left onto Market Street. Take Market St. to the traffic circle and make a right onto High. The Synagogue is half block on your left. Also, you can usually get a cab from the train station. Bear left onto Fayette St. Make second right onto High St. Follow High St around traffic circle. Northbound Garden State Parkway to Exit 127–Right after the toll, Follow signs to Perth Amboy, RT 35N, After the bridge, make a Right onto Smith St.
Take 440 S over the Outerbridge Crossing into NJ. Take the Amboy Ave. exit and at the light at the top of the exit make a Left. Follow Amboy Ave. to the end and make a Left onto New Brunswick Ave.